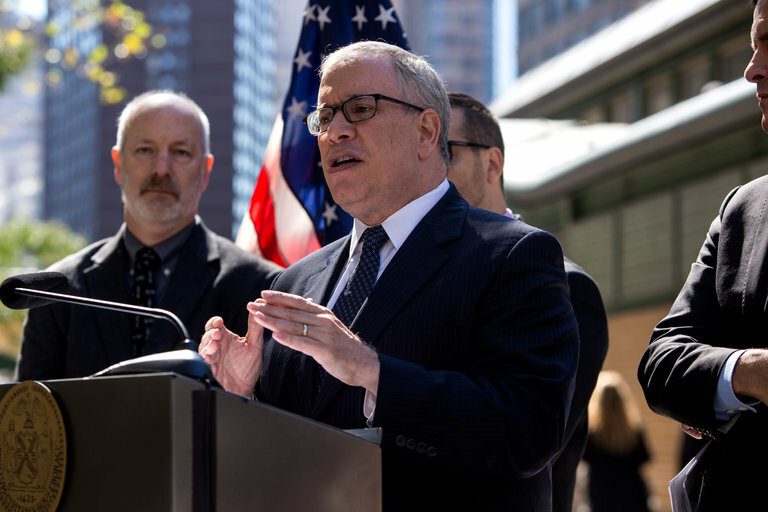 Scott Stringer, the city comptroller, will become the first citywide official to back primary challengers to members of the Independent Democratic Conference. A campaign to unseat eight state Democratic senators — members of a renegade group that has helped empower Republicans to rule the Senate in Albany — will receive a significant boost from the city comptroller, Scott M. Stringer. Mr. Stringer on Thursday will endorse two Democratic challengers trying to topple members of the group, the Independent Democratic Conference, in the September primary. The cooperation of the eight-member body has helped allow Senate Republicans to control the chamber even though they are outnumbered by Democrats. Mr. Stringer will endorse Robert Jackson, who is challenging Marisol Alcantara in Manhattan, and Jessica Ramos, who is challenging Jose R. Peralta in Queens. Although the I.D.C. was created in 2011, its existence — largely tolerated or ignored by many Democrats in New York — has now become a hot-button issue. The Working Families Party and the True Blue Grassroots Coalition, composed of over 60 groups, have endorsed a slate of Democrats trying to oust I.D.C. members. Ms. Ramos was also recently endorsed by Councilmen Jimmy Van Bramer and Costa Constantinides, both of Queens. Mr. Stringer’s endorsements will be looked upon favorably, said Jonathan Westin, the executive director of New York Communities for Change. “We will remember where people have been at on these big fights,” Mr. Westin said. Mr. Stringer’s endorsement obviously adds credibility to Ms. Ramos’ and Mr. Jackson’s candidacies and will help with fund-raising, said Christina M. Greer, a political-science professor who is a McSilver Institute Fellow at New York University, but it will also yield benefits for Mr. Stringer, a leading 2021 mayoral candidate. Along with Mr. Stringer, the city’s public advocate, Letitia James; Eric L. Adams, the Brooklyn borough president; and Ruben Diaz Jr., the Bronx borough president, are just a few of the well-known Democrats expected to run for mayor. The endorsement allows Mr. Stringer to position himself as a progressive Democrat. 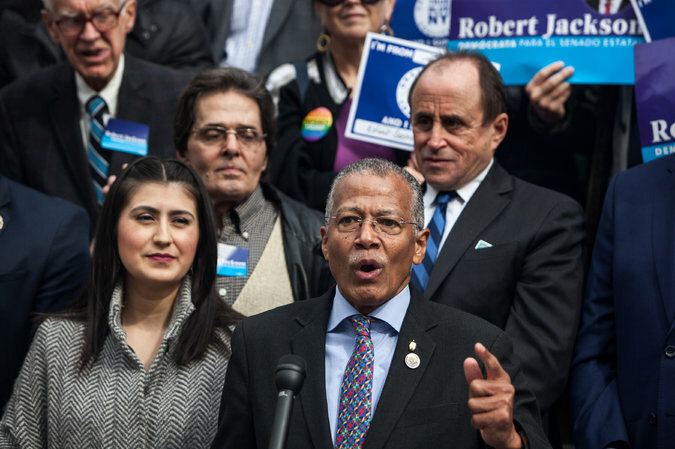 Jessica Ramos and Robert Jackson, lower left and right, have received the endorsements of many anti-President Trump groups in New York in their bids to unseat Democratic incumbents who belong to the renegade Independent Democratic Conference. Mainline Democrats have argued that the Republican arrangement with the I.D.C. dooms progressive initiatives such as bail reform, stronger rent laws, abortion rights, single-payer health care and ethics reform. Another Democrat, Senator Simcha Felder of Brooklyn, is not a member of the I.D.C. but caucuses with Republicans. Mr. Klein said that “members of Independent Democratic Conference are fighting for New Yorkers by doing real legislative work and shaping budget policies to address the immense challenges facing the people of New York City,” citing issues such as public housing and subway repairs. Michael Mulgrew, president of the United Federation of Teachers, said the focus now should be on fighting federal policies that hurt the city and state. He said the I.D.C. should return to the mainline Democratic fold, but that it was an issue best left until after the election. Mr. Stringer, a former Manhattan borough president and state assemblyman, compared his early endorsement to the time he was an early proponent of ending so-called empty-seat voting in the Assembly, which allowed elected officials to sign in and be counted as a yes vote on legislation even if they were not present, unless they indicated otherwise. Others saw more gain than risk in Mr. Stringer’s early endorsement. Even if the candidates that he endorses lose, Mr. Stringer could characterize his decision as a fight against President Trump and the Republican Congress.